Not long ago, I did a review on Qwirkle about requiring flexibility in recognizing different patterns in order to win. The review met with much positive response and I was thoroughly surprised with how many people didn't know about Qwirkle. And now I'm very curious about your thoughts again. 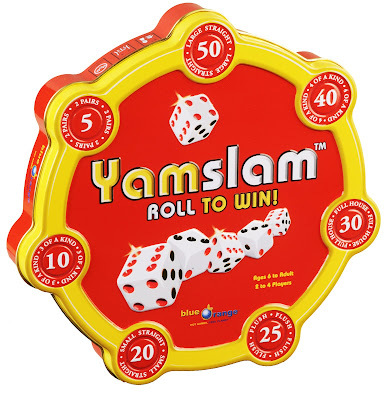 Have you ever heard of a game called Yamslam? I have no idea what this word means but its one my kids' favorite words now. It was created by a company called Blue Orange who are known for their bestseller game "Spot It." In the catalog, I saw Yamslam, a game in which the design is clearly different from that of the other games reviewed here. I never gave Yamslam a second thought and I'd keep flipping those pages. But one day, my son and I happened to be looking at the catalog together and when he saw this game he BEGGED me to buy it. "It looks cool," is the only explanation I got from him. It wasn't that expensive and so I bought it. Pretty soon it arrived home and we started playing and I wondered what the heck did he see that I didn't see because Yamslam has got to be one of my top five games I've played this year! Children are so intuitive. I wonder if they can sniff out a winning game faster than a grown-up can... probably. I love games that are easy to learn but not easy to win. This is definitely one of them. It's kind of like Poker but with dice and so obviously the rules do differ. There are different points assigned for specific sequences or patterns (5 points for Two Pairs; 40 points for Four of a Kind, 20 for a "Small Straight" Four die in consecutive numbers). The directions have pictures which help a lot! If you score, you take the corresponding chip. If you've liked the games that we've talked about here such as Mine Shift, Qwirkle, and Tetris Link, then you MUST TRY YAMSLAM . The cover of this game in its own tin says "8 and up" but my five year old is able to play along and accept some coaching as we play. This game goes so fast that you are often not thinking about how many points you have (Lose and Win Gracefully). After each turn, the game changes because what can be earned could change too. For example, if all the Two Pairs-tokens were claimed, even if you rolled two pairs, you would not score and this is great because you must keep that in mind when you are rolling to take a chip. This requires your child to be flexible and to see as many different possible patterns that he can. I love that kids are having to think and visualize about possible outcomes. That shouts "Planning Skills" to me, loud and clear! 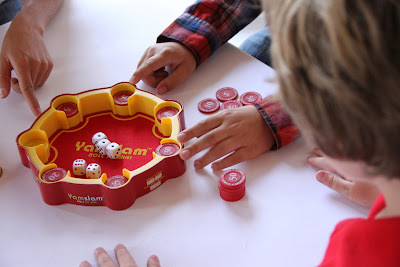 Yamslam can be used to teach probability. Grown-ups may often find that they are getting their butts kicked by the kids. I think that is because grown-ups underestimate the power of chance, which is another big element in this game. Kids are in love with being lucky. And oftentimes, I see them going for the gold and scoring a Yamslam, sometimes 2-3 times in a row (rolling all five dice with the same face). Scoring the Yamslam requires luck but sometimes you will never see one unless you dare to fail. But it's kind of crazy all that you can learn. You can either try to talk about probability through teaching as you play or you can sort of clam up and let the game teach your kid. I think in both cases, you just have to play it often which believe me, is very likely going to come natural in your home. Since we got this game, it's me who asks my kids to play Yamslam. (I am a little addicted). When you seek to roll again and but want to keep some of the die you rolled, slide-nudge it to the side with your fingernails rather than covering the die or even picking them up to place it on the side. I'm not accusing them of cheating, rather, I explain that when they leave less room for questions, everyone enjoys the game more. Do not grab the die out of turn, even if you are "just so excited." You make others feel like they aren't important. Try to fold your hands and use your eyes more often when you feel this way. Do not touch others' chips to see what they've got-even if you are curious and keep your chip total sum to yourself. Boasting ruins fun. Keep your advice to yourself too. Everyone has their own way of playing. If you do want to help, then ask others if you can give them some advice. Kids are always hoping that they'll get a "Yamslam" which is five die with the same face. Oh how I love this job! Sometimes you think you've seen them all but then you come across a gem like this and you feel like there is so much more to learn! Yamslam is a huge winner here. I think it will be hard to find a kid who DOESN'T like this game. I certainly have not! Oh!!! I also found out that you can try Yamslam on your iPhone or iPad too. But please do try to play with the actual physical game. There is something about the roll of the dice that is exhilarating. Now it's time to win your own Yamslam! Blue Orange games is giving one game away to TAT Readers! Thank you so much! This game can only be sent to U.S. addresses. Can't wait to see if you've won? Try my Amazon link here. Remember, the MSRP is 19.99. In case you're wondering.... Toys are Tools is not compensated in any fashion by the manufacturer of the product that is being reviewed. To facilitate the review, Toys are Tools was given the product by the company. Reviews are never promised. The giveaway item is being supplied by OWI. Thank you so much OWI! http://www.blueorangegames.com/doubleshutter_classic.php What an awesome looking math game! I am very curious about Fast Track Fast Track http://blueorangegames.com/fastrack.php I am excited to ask Aimee Prainito, our expert occupational therapist about it. She is brilliant! thanks Andy! A ten year old girl who loved Yamslam asked me to look this up too! So embarrassing that I barely know how to play Yahtzee. But that is what everyone tells me. Thanks for your comment! Please review Gobblet. I like wooden games. spell it. It would seem to me that five dice would not be enough to spell a lot of words. and I'd like to see if by adding more dice you can spell longer words. Hi Jenny, Is Bananagrams part of the lineup in Blue Orange Games? The question is to let me know what you think is interesting and worth looking into at Blue Orange Games and leaving your answer in a comment here. Here is the link: http://blueorangegames.com/games_chest.php Good luck!! I l The suggestions so far have been amazing! If you can't go out, then you stay on 10s. You can continue play until one player is able to go out on 1s.